Perfect for children between the ages of 8 and 13 in an easy question and answer format, with delightful illustrations to add a fun element, it will double as an invaluable guide for parents so that they can answer their children’s questions candidly, with knowledge, sensitivity and humour. To order the print books internationally on Amazon, click here. A South African bestseller now in its 11th reprint. Ilze van der Merwe has two children, aged 27 and 29. She is an educational psychologist in private practice with a passion for families. She is a certified Demartini Method facilitator. Ilze is well-known for her popular parent workshop, How and When to Tell Your Children about the Birds and the Bees as well as Powerful Parent Powerful Child among others. She is a director of Bella Vida Centre in Johannesburg. Nikki Bush has two children aged 19 and 15. She is a creative parenting expert, inspirational speaker and author on child and parent development issues and is passionate about helping parents connect with their children. 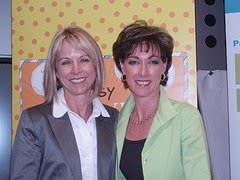 She is highly regarded among parents and educators alike and is well-known for her many dynamic presentations including Future-proof Your Child©, Parenting on the Run©, Connecting through the Noise & Clutter© and more. 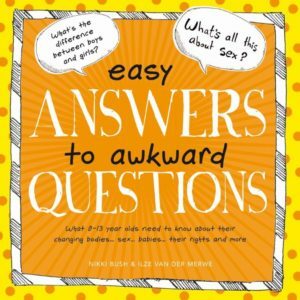 Easy Answers to Awkward Questions comes at just the right time. Parents and teachers have long grappled with the complexities of sexuality education of children. Many have coped outstandingly when it comes to matters of the birds and the bees in the early years, but sexuality education for the pre-pubescent and pubescent child is a completely different matter and is not for the faint-hearted. Ilze and Nikki’s book is a considered work. It is neutral and non-judgemental, making it accessible to people from all walks of life. Heather Smith	Recently retired principal of Wendywood Primary School, Gauteng, where she was also the Life Orientation educator (a portfolio that addressed values, morals, ethics, and life issues such as HIV/AIDS and sexuality). Recipient of the Lifetime Achievement Award in Education 2008 (National Department of Education). Nikki, thank you for playing with us, in a most remarkable way. You really have been an inspiration today – your passion for play, connecting – I think you are a phenomenal woman, might I say! A mother, a wife, I’m surprised you are not a psychologist or an educationalist, because you have it all wrapped up so beautifully. I think what came through most was your plea for us to honour our children and our families, to make time for them by really prioritising, by finding the joy in ourselves and eliciting it in others. It has been a remarkable hour and we really are so delighted that you’ve come via Pietermaritzburg to Durban because we don’t often have the opportunity to have somebody with your passion, your expertise and your very, very practical ideas. And speaking from the heart about your own children really resonated so with us – it wasn’t just the theory out there. Thank you for your very high, high touch!